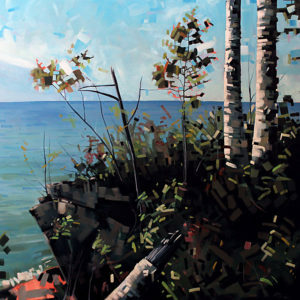 Reid Thorpe was born and raised in the rural Wisconsin town of Platteville and grew up spending countless hours hiking, canoeing, and enjoying the outdoors of his home state. He now lives and works in Chaska, Minnesota. Reid attended Minneapolis College of Art and Design, where he received his B.F.A. in Studio Art. He went on to receive his Art Education degree from The University of Minnesota Twin Cities. Reid has taught a variety of subjects including Jewelry and Video Production in the classroom. His expertise lies in the two-dimensional realm of drawing and painting. 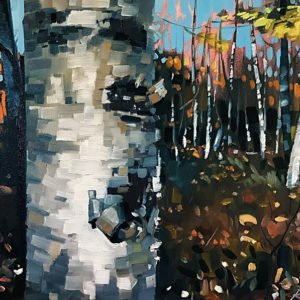 Reid’s current work focuses on the land of the Upper Midwest; trees, architecture, and wide-open spaces, and the way each interacts with color in nature, inspire him. 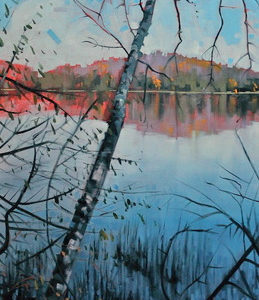 Reid's current works are contemporary landscapes (views) from the Midwest, specifically Wisconsin and Minnesota. 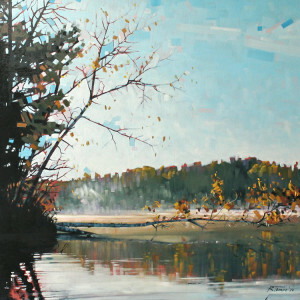 Reid creates images that offer a new perspective of nature’s depth and beauty. He uses color, calligraphic line and bold brushstrokes to create images of depth and beauty in his views. Reid was born and raised in the rural Wisconsin town of Platteville and grew up spending countless hours hiking, canoeing, and enjoying the outdoors of his home state. He now calls Chaska, Minnesota his home. 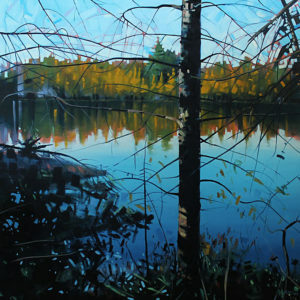 Reid studied Studio Art at Minneapolis College of Art and Design, where he received his B.F.A. He went on to receive his Art Education degree from The University of Minnesota Twin Cities. 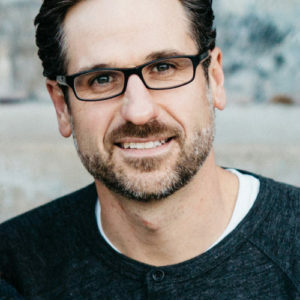 Reid taught a variety of subjects at the High School level for twelve years before pursuing his career in the Fine Arts. My philosophy of creating art branches from a solid foundation in aesthetics, the study and exploration of beauty. I use the elements of color and line to create tension and harmony within my work, discovering the balance of beauty and interest that each work demands. 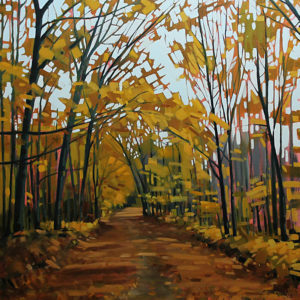 Through this process, I strive to capture the beauty and intention within each scene I paint. 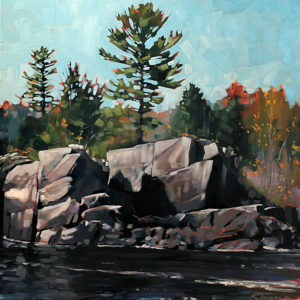 I find inspiration for my work in nature, more specifically in Minnesota and Wisconsin where I spend most of my time. 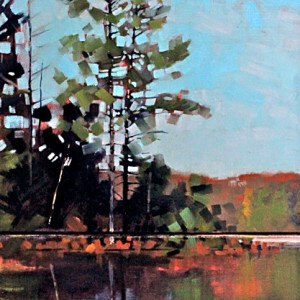 Through color, brush-stroke, and composition, I add intention to each natural scene. The colors I choose promote both contrast and harmony with the goal of evoking an emotional response. 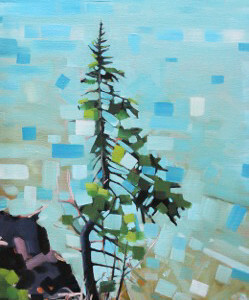 I use “blocky” paint strokes to fragment and simplify the landscape. The odd-sized canvases I use quite often create dynamic compositions and continue the theme of fragmentation. 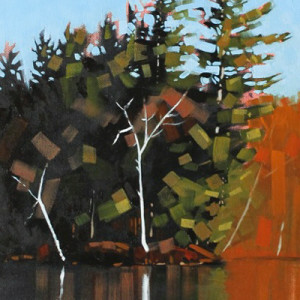 Other main features of my works include strong horizontals and verticals featuring trees, reflections, and natural settings. My current work explores the concept or feeling of nostalgia within fragmented landscapes using reflection – and the interplay between sky and water. 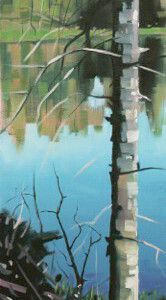 I use reflections of water and fragments of sky to create juxtaposition within the work. I exaggerate the mosaic in negative spaces in contrast with the smooth quality of water. Whether walking outdoors alone or with my family, I search for these views through trees featuring colors, sky, and reflection.